My son is a huge fan of the show Chuck & Friends. He has a few toys of his favorite characters laying in his room. So when I had the chance to review the latest DVD from the series that came out, January 21st, I was pretty excited because I knew how excited he would be and I was right. Once he saw the case, he immediately wanted to watch the show, which came with 10 entire episodes, plus a bonus feature of a sing-a-long. One thing I love about this show is that in each episode there is always a lesson learned that can relate to situations with friends and the characters help show you and each other how to be a great friend. I also love that there were lots of songs that my son could easily sing along to. If you have a little one that's a fan of Chuck & Friends, I'd definitely suggest adding this to your collection for them to watch! Disclosure: All opinions are my own. 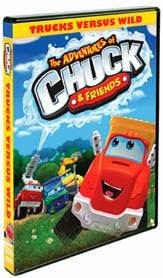 I received The Adventure of Chuck & Friends on DVD at no cost for the purpose of this review.